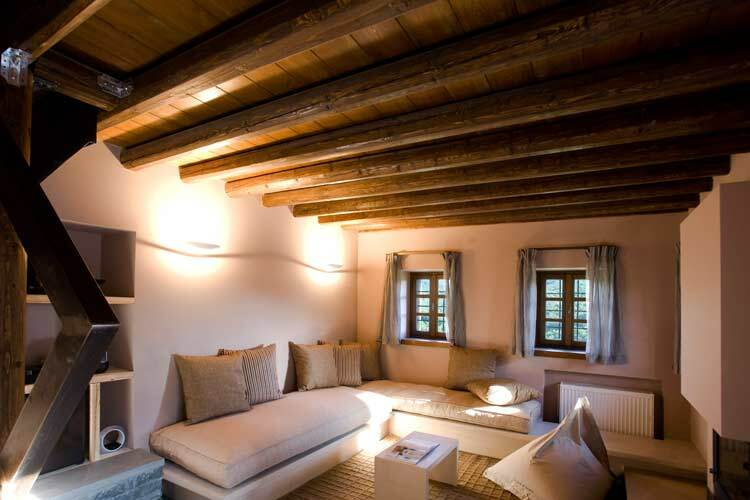 Kipi Suites is an exclusive eight room boutique hotel situated in a privileged mountain location in Greece. Comprised of five buildings, Kipi Suites blends in like a neighborhood of the traditional village. 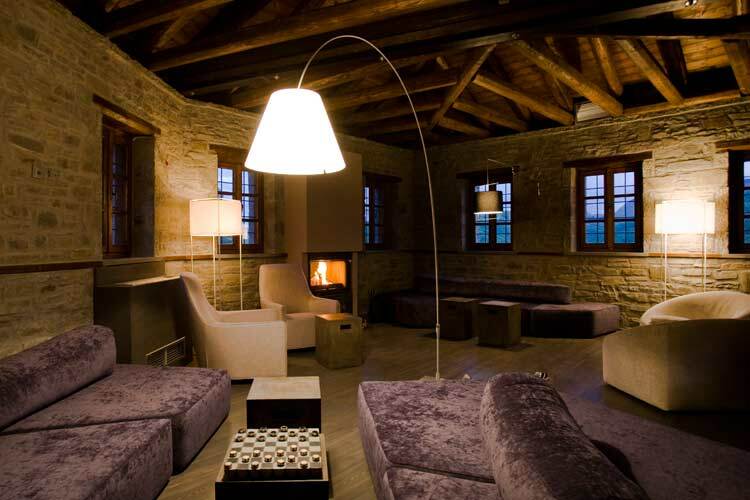 The eight different Kipi Suites, all with separate entrances and fireplace, provide for the ideal base to explore the enchanting area of Zagori. Discover the unparallel beauties of the National Forest of Vikos-Aoos and Valia Calda. Trek in the intact nature of Vikos Gorge. Raft the green waters of Voidomatis River. Swim in Drakolimni Lake at 2300m altitude. Climb the gentle slopes of Mitsikeli Mountain at Aspraggeli village. Ioannina with Pamvotis lake and its vibrant night life is just 30Km away. Kipi Suites Guesthouse is a unique combination of tradition and modern. Two houses were transformed on the inside into a modern luxurious guesthouse using the period methods and techniques. Another three small buildings were constructed nearby using stone and wood, the characteristic architecture of the area. All material used are ecological and special care is given to energy and water saving. 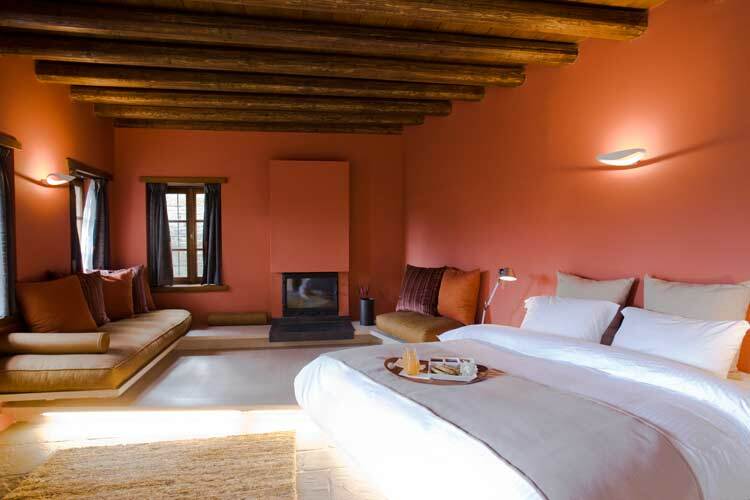 While Kipi Suites is easily accessed, it offers seclusion and quietness. The only sounds you can hear are those of the birds and the Bayiotiko River. 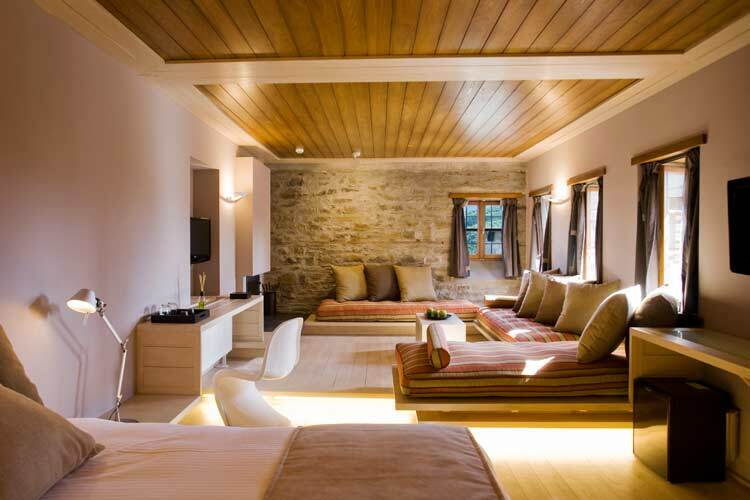 All eight suites are different with separate entrances named after villages of central Zagori. The interior decoration is modern and minimal with warm colors and special lighting features, while the architectural features are inspired by the traditional Epirus concept of "bassia". All suites are designed for two persons, except for suites Ano Pedina and Dikorfo, which can accommodate up to one additional adult with an extra charge. Elafotopos: 35s.m. in one level with en-suite living room, King size bed, Fireplace, Shower, Private porch. Koukkouli: 35s.m. in one level with en-suite living room, King size bed, Fireplace, Shower, Private porch. Dikorfo: 44s.m. in two levels, Two queen size beds, Two fireplaces. Can accommodate up to one additional adult with an extra charge. Jacuzzi, Private porch. Elati: 45s.m. in one level with en-suite living room, King size bed, Fireplace, Jacuzzi and separate shower, Private porch. Kato Pedina: 42s.m. in one level with separate living room, King size bed, Fireplace, Jacuzzi, Private porch. Ano Pedina: 42s.m. in one level with separate living room, Two queen size beds, Two fireplaces. Can accommodate up to one additional adult with an extra charge. Jacuzzi. Vradeto: 45s.m. in one level with en-suite living room, King size bed, Fireplace, Jacuzzi and separate shower. Kapesovo: 52s.m. in two levels, King size bed, Two fireplaces, Jacuzzi, Balcony. Dining: Dilofo Bites and Kipi Lounge welcome also guests that do not stay in the guesthouse. Dilofo Bites: Breakfast and light snacks are served throughout the day in Dilofo Bites restaurant. All their breakfast delicacies are home made, always using fresh local ingredients. Taste their home made breads, marmalades, yogurt, biscuits, desserts and pies that change on a daily basis so you don?t get bored! The breakfast buffet is complemented by a wide selection of cheeses, cold plate, eggs, fruit and natural juices. From noon onwards and until 21.30, Dilofo Bites serves light dishes accompanied with soft drinks and spirits. Addtional plates or menus can be arranged with guests, upon prior notice. Weather permitting; enjoy breakfast or snacks in the front yard with a beautiful view to the mountains and the river below. Kipi Lounge: from midday onwards coffee or drinks are served including a wide selection of over 60 of top Greek wines. Comfortable sofas and couches for ideal times of relaxation accompanied by a book and good music or for board games and endless discussions. Due to the small size of Kipi Lounge, children under 15 years old are not allowed. Special Events: Upon arrangement, the hotel can be booked altogether for a family or a group that enjoys exclusivity with a five-star service. Children: Children up to 2 years old can stay in the room free of charge. Baby cots can be provided upon request free of charge. Due to the small size of Kipi Lounge, children under 15 years old are not allowed. 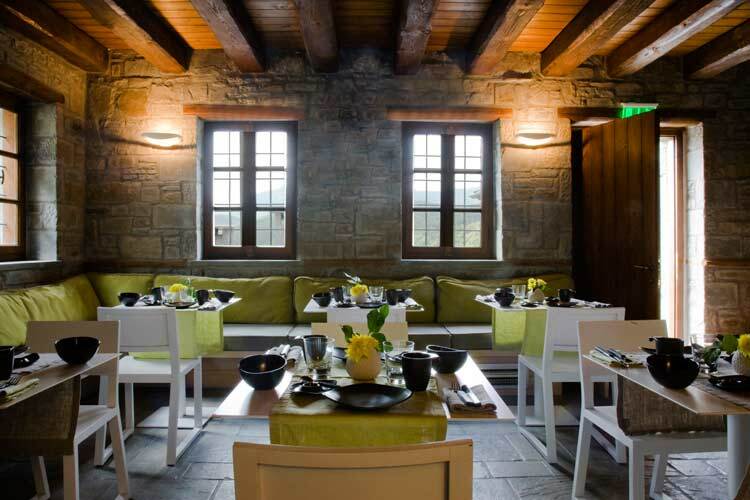 Activities: Zagori offers activities all four seasons. You can trek the marked paths, raft the surrounding rivers, do rock climbing (there are maked trails in Kipi Village), slide the slopes of Mitsikeli Mountain with parapente, mountain bike thought the nature, and swim in the crystal clear waters of the rivers. There are also numerous churches, monasteries, museums and other cultural activities (e.g. wool work shop ) to complete your trip to Zagori.